Brilliant golden amber color. Aromas of papaya creme brulee, pineapple cake and caramel corn, chive marmalade, and pine cleanser with a slightly chewy, tangy, finely carbonated, fruity medium-to-full body and a warming, complex, very long honeyed grapefruit, kumquat, and herbs, peppercorns, rapini, and candied ginger finish. A complex and layered IPA with great vibrancy and impact. Bottom Line: A complex and layered IPA with great vibrancy and impact. Imperial IPAs, or double IPAs, are deep gold to deep amber in color and range in alcohol from 7.5-10%. These beers are medium-to-full bodied and are distinguished by prominent American hop aromas, flavors and an abrasive, lingering hop bitterness. These intense hop characteristics should be balanced by a rich malt backbone. Depending on the varieties of hops used, a wide range of flavors including tart citrus peel, pepper and earthy, pine-like flavors and aromas may be encountered. 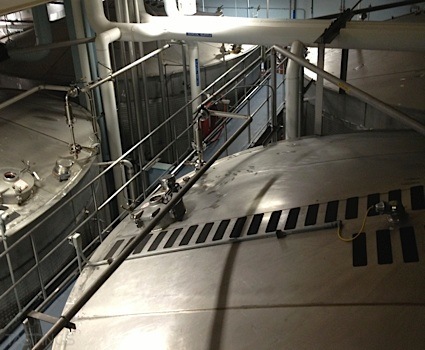 These ales represent a challenge to brewers in terms of balance and drinkability, and have exploded in popularity in recent years with many craft breweries producing a version of the style. Noteworthy examples of this style include: Moylan’s Hop Craic XXXXIPA, Rouge IP2A Imperial India Pale Ale, Stone Ruination IPA and The Alchemist Heady Topper. 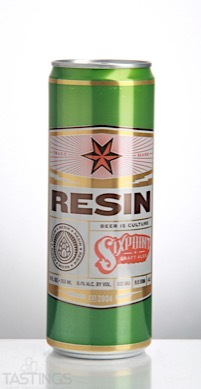 Sixpoint Brewery Resin Imperial IPA rating was calculated by tastings.com to be 92 points out of 100 on 4/12/2017. Please note that MSRP may have changed since the date of our review.